hello, hello! i’m so, so excited you are here, that you found something with re-nest studio that spoke to you, and wanted to find out more! welcome, welcome, welcome! 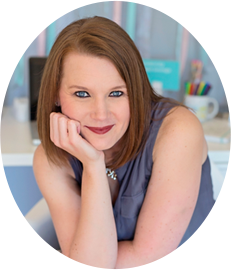 i’m ashley, and re-nest studio is a little dream for this mama/wife/daughter/sister/crafter/home decor obsessed lady. my craftiness started at an early age. it was all cultivated and nurtured by my mimi, who spent hours with me, teaching me how to cross-stitch and make things from scratch. 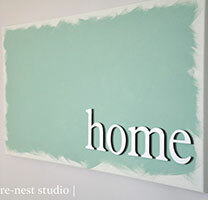 it’s my mimi that i attribute my love of craftiness to…and who i know would be over the moon at the re-nest studio. it’s been one of the greatest thrills of my life knowing that what she taught me, i am now able to pass along to my boys and share with others. in an age where so much of our lives are digital, getting your hands into something, making something, creating something from nothing, can be one of the most awesome feelings you can have! i’ve lived the classic challenge: you want to decorate a space, and you look high and low for something different. the things you see in the store are mass produced (otherwise known as: you’re likely going to see it in another person’s home sometime this year!) or, everything you’re finding won’t feel like home to you. i knew that i wanted everything that i put in my home to have a purpose, and ultimately, to help tell my family’s story. and, i had a hunch that other people might feel the same way. this was the start of re-nest studio in 2012.
my goal is to help create meaningful decor for your home that helps you tell your story. a home is so much more than four walls; it’s a collection of memories, events, love, accomplishments, and so much more. i love being able to help you tell those stories through my designs. 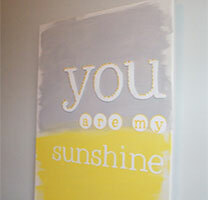 the designs that i create blend hand-painted canvases with die-cut paper art. all lettering is individual die-cut paper letters, which i hand place and hand adhere on each canvas with tender loving care. 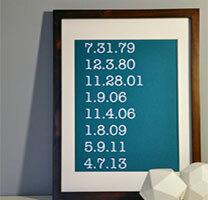 smaller framed designs are available, which featured layered paper art designs included in a frame. 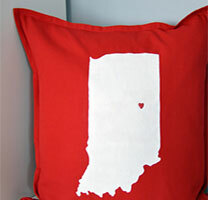 all throw pillows are hand-painted with acrylic paint. in 2014, i was elated to expand beyond just home decor to another passion of mine: custom party decor! after styling nearly fifteen childrens birthday parties, baby showers, and bridal showers it was time to share my love and handmade craftiness to the party world!